When you have more than one computer, you run the chance of “losing” a file. Losing as in not remembering which computer you wrote it on. For me it was an 80,000-word-plus second draft of the 2012 NaNoWriMo rough draft. I was convinced it was on my laptop, and I even found a version of it, except I didn’t know it was a version. I thought it was the file I was looking for. About four chapters of re-writing later, I knew something was wrong, but I couldn’t put a finger on it, so I plodded on. The nagging sensation I didn’t have the right version kept kept up to the point where I put everything aside because I wasn’t happy with the result. I recently picked up on the “grown-up” coloring book fad and bought a couple of books and seventy-two art pencils. Hey, I do nothing in a low-key way. One book is called Balance: Angie’s Extreme Stress Menders, Volume 1 by Angie Grace. 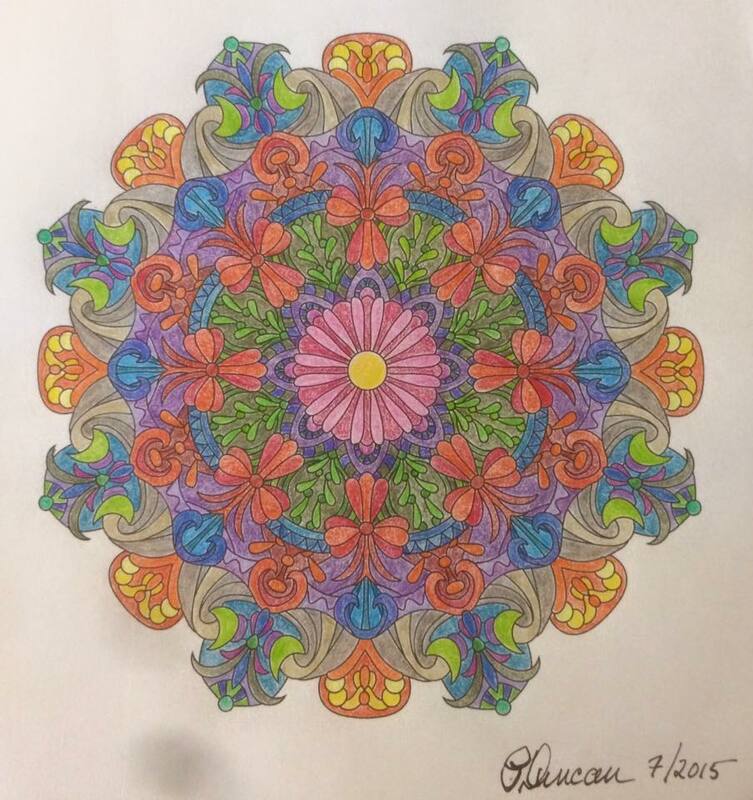 It’s a book of mandalas, uncolored, so you can, well, color them. I didn’t have extreme stress, only the mild stress of a re-write not going the way I expected and the last-minute details of planning and putting on a one-day writers symposium. Okay, that had begun to border on extreme stress. I’m not in the least artistic, as in painting and drawing. Writing is my art. I was a big fan of paint-by-number when I was a kid. One such “masterpiece” hung in my apartment until I bought a house and started collecting art from people who knew what they were doing. When I was a flight instructor and had to draw airplanes on a blackboard to illustrate a fine point of aviation, my students invariably laughed at my renditions. I was a Bob Ross drop-out; no happy little trees in my muddy paintings. Grown-up coloring books aren’t paint by number because you have to choose the colors and where you’re going to use them, so I figured this was going to be a disaster, but I’d taken art in college (wherein the professor suggested that perhaps I should become an art historian rather than an artist), so I knew the color wheel and color families. And I had seventy-two art pencils to choose from. Not bad, eh? Actually, I think it’s a bit chaotic and probably should call it “Chaos.” I certainly don’t think it has the calming effect Ms. Grace anticipated in her book. 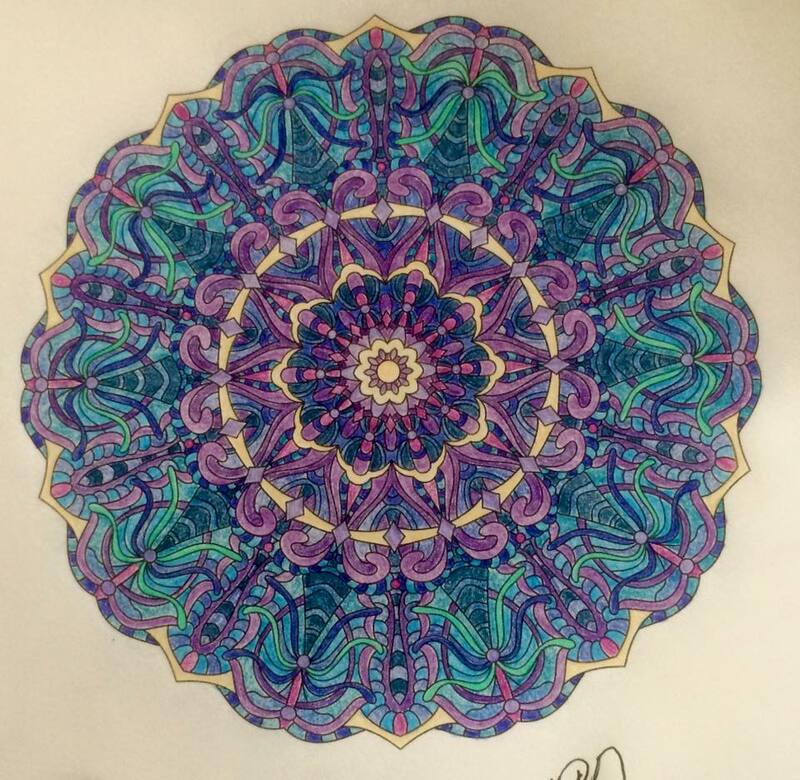 A mandala in Oriental art is “a schematized representation of the cosmos.” In Jungian philosophy, a mandala symbolizes trying to reunify the self. Ah, much better, and toward the end of this one, I thought, “Look for the draft on the other computer.” Lo and behold, there it was, the file I wanted to re-write from. Self reunited. Of course, indulging my “artistic” wants takes time from my work, which is writing. However, Mandala 2 cleared a great many cobwebs away and helped me focus the re-write approach. Trust me, before that I was like a Roomba blundering into a piece of furniture and backing up, only to blunder into a different piece. Now, I can do the re-write justice. I’m sure there’ll eventually be a need for Mandala 3. I haven’t blogged in a while. My apologies. There was the run-up to the holidays, the holidays, a six-week-plus bout of the flu, then a set-back in my writing career which had my finger hovering over the “delete all” option in my Writing folder on my hard drive. Then, I realized the only way to cope with that set-back was to write about it. Anyone who writes knows how hard it is to send stories out into the world of contests and literary magazine publication. Most of the time, those stories get rejected, some with a modicum of hope (“send us something more”); some with not so much as an acknowledgement of receipt. The rare time something gets accepted is such an ego boost, we can live off it alone for months. This is the validation every writer craves. I recently had a two-fer: I wrote a story for a contest, and it not only won but earned an offer of publication. Double validation. BTW, I’m not mentioning the name of the contest (to protect the innocent) nor the name of the magazine (so I don’t give the guilty any inadvertent publicity). I said yes to the offer of publication, of course, because I’m not at the point in my writing career where I can casually turn such things down. If I’d known then what I know now… Except, well, I did my research. Not only did I discover this particular online magazine had a low acceptance rate, i.e., difficult to break into, according to Duotrope, but publication in it was a qualifier for membership in the Science Fiction Writers of America. The positives were adding up, and I was looking forward to my story being published early this year. I set it aside for a while, mindful of the contest’s deadline; then, I dusted it off and did some editing. This was a story which resonated strongly for me, but I researched to assure I got the history and the culture correct. (I have a degree in history; research is my be-all and end-all.) If something was slightly off, I realized that in writing fiction, I had a certain amount of dramatic license, especially for a piece which had both a fantasy and a sci-fi tone. I was happy with it, happier than I’ve been with a lot of my short stories. As I said, I thought this story had a definite future. I submitted the story. I knew it was strong enough to be a finalist, and it was. What I didn’t expect was to win, but I did. The offer of publication was icing on the literary cake. This past Saturday I went to a National Novel Writing Month (NaNoWriMo) write-in in Harrisonburg, VA. Seven of us made it and commandeered a corner of Panera to have some writing fun–word sprints, where you write as many words as possible in a set amount of time, and the “no backspace” game. The “no-backspace” exercise really suppresses your inner editor, and the exercise consists of writing and not backspacing or deleting anything, not even a typo. The person who can go the longest without backspacing is the winner. In the first go-round, I lasted six words; I made it to about 200 words the second time around, but, oy, what a mess! The concept of NaNoWriMo is to write without editing yourself in the moment. That comes later. By not editing as you write, NaNoWriMo-ers believe you tap into creativity that pausing to edit disrupts. Writing purists may cringe at such seat of the pants writing, which does sacrifice structure to a certain extent, but I find it particularly liberating. A few weeks ago at the James River Writers Conference I heard Tim Robbins explain his writing process. The reason years pass between his works is because he literally perfects one sentence at a time and doesn’t go back to revise when the book is done. When he finishes a book, he considers it edited and revised because of this rigid method. I’m not dissing that sort of structure; in fact, I admire it, and, obviously, it works for him. I’ve always been the type of writer to get what’s in my head down on the page, then I go back and “fix” it–rather a middle ground between a seat-of-the-pantser and the dedicated structuralist. When I’m not doing NaNoWriMo writing, which, by the way, is eleven months out of twelve, I typically start the next day’s writing with a review and rework of what I wrote the day before. That refines it for me and gives me a basis to begin the next part. It’s true I rarely work from a written outline, but I usually have the structure in my head. I’ve always jotted down notes and ideas for anything I’ve written, but I, personally, find a detailed outline confining. I haven’t adhered to one yet. The free-wheeling aspect of NaNoWriMo is what appeals to me, to just sit down and write without second guessing a sentence or what a character says or whether this is the direction the story should go. I know I’ll go back and fix that later, and the very act of putting the editing and revising off for a period of time, unleashes my brain. For example, I had a fairly detailed list of scenes I’d foreseen for this year’s project, but somewhere about a third of the way through getting those scenes fleshed out, a new direction emerged. Frankly, you can’t ignore that. You can’t limit yourself to an outline or a list of scenes and not be flexible. At least I can’t. If the idea pops up that I need to go over here and explore something, I have to go do it. I may end up tossing it out in editing and revising, but I have to write it when it manifests itself. The NaNoWriMo project from 2009 wound up in an entirely different way than I ever intended. The idea came to me that I should kill off one of the two main characters I’ve written hundreds of thousands of words about, so I did. It was an amazing writing experience to explore the thoughts and feelings of the person left behind (and a great outlet for those same feelings after the break-up of my long-term relationship). When I got to the revision stage, though, I knew it was wrong. I’ve joked the character tapped me on the shoulder and said, “It’s not my time, yet.” Purists scoff at the idea that characters speak to you or direct a story, but I know what I know. The character was right; I knew I wouldn’t be able to write more stories in the genre I’d chosen if he weren’t around. That’s not a wasted manuscript though; I’m incorporating large portions of it into another plot. Another NaNoWriMo MS I’ve mined for short stories. Yet another, after editing and revising, just completed a trip through my critique group, and after another set of revisions, will be ready to see if someone is interested in publishing it. I haven’t touched the MS from last year (2011), but that’s on my list for projects in 2013. This year’s? I’m so pleased about the direction it’s headed and the fact I decided to strengthen my literary fiction skill set, that it will be a 2013 revision project as well, probably toward the end of the year to get time and space between the writing and the revising. NaNoWriMo is neither futile nor frivolous. It is, however, what you make of it. If you treat it as a creative way to develop a first draft, it can be very fulfilling. And great fun. This weekend, eleven days into the adventure, I hit the 30,000-word threshold. At the NaNoWriMo average of 1,667 words per day, by day eleven 18,337 words would have put me on track to finish with 50,000 on day thirty. Well, I’ve always been an overachiever. The point is, without that artificial stimulus, that “imposed” deadline, I would never have written an average of 2,700 words a day. That’s worth it to me. Someone in the audience asked the panel if any of them had ever had the experience where a character took a story in a different direction from what the writer had planned. This well-known and beloved author apparently sneered and said words to the effect that characters in his books are fiction, and the idea that fictional characters “talk” to writers means the writer is nuts. My writer friend was dismayed at the answer. It actually put her on quite the downer, then she added that she still liked his books and would continue to buy them. My question is why? Why continue to support someone who is so contemptuous of his audience? I suppose you can separate a person’s body of work from their personality. I mean, my favorite author is Harlan Ellison, for whom the appellation “curmudgeon” is an understatement. However, Ellison has never dissed his audience. In fact, nearly forty years ago, Ellison picked me from a crowd of fan-boys and -girls to give me some personal writing advice. He was charming and encouraging, and, though his over-sized ego was definitely present, he never once disdained any of my stupid questions. That was twenty minutes of my life I’ll never forget. When Tom Clancy gave an interview many years ago where he proclaimed that anyone making under $100,000 a year simply couldn’t relate to him or he to them, I was astounded and dismayed. That was the key demographic who bought his books, who made him a rich man, who enabled his first wife to buy him a freaking tank for his birthday. This, from the former insurance salesman who let fame and fortune go far enough to his head that he appeared on Fox as a “terrorism expert.” I stopped buying his books. The reality is, yes, characters in a novel are fiction, but they are real enough that you hear their voices in your head. If you didn’t, they wouldn’t exist. That isn’t crazy; it’s creativity. And, yes, characters sometimes insist that the story go in an unplanned direction. That isn’t crazy; it’s creativity. The other reality is successful writers are human beings with personality quirks, and sometimes some of them reach a point where they don’t feel they need to cater to their audience anymore. They don’t have to be nice and indulge a perfectly reasonable question from a fan. I’m not saying we shouldn’t look up to writers. As writers ourselves, successful writers are whom we aspire to be. Just accept that those successful and popular writers are human beings, too. Admire them, emulate them, but don’t idolize them. Spotting their feet of clay can be so earth-shattering. How about you? Has a writer you’ve admired said or done something that has made you boycott their books? Seat of the Pants Writing? Blame it on my history degree, but when I write fiction I still research to add that desired verisimilitude (one of my favorite words, by the way). Take today’s Friday Fictioneers photo (click on the story link below to see the photo by fellow Fictioneer Sandra Crook), for instance. I wanted some context–where it’s located, what’s its significance, and so on. On closer examination, there is oriental writing, but is it Japanese, Chinese, Korean? No one except the photographer seemed to know, and she didn’t enlighten us, preferring, perhaps, not to limit our creativity. However, I don’t want to plunk my two leprechauns (Seamus and Declan) down if I can’t establish a good reason for them to be there. Though, I concede that’s an interesting concept, considering the photo’s contents–Seamus, Declan, and the Buddha. Since this is about creativity after all, I did what every good pilot does when the instruments fail–fly by the seat of his/her pants. Eastern religion has fascinated me for a while, and I’m but a dabbler. The journey to enlightenment isn’t easy and isn’t supposed to be, but the struggle is always within yourself, much as with Islam. (Jihad, that much-abused word, is the inner struggle to be a better person.) Dukkha has been misinterpreted as suffering, but it is more a state of un-satisfaction that keeps you from enlightenment. Sukha or happiness is, of course, transitory and unattainable, a lesson that’s sometimes difficult to learn. This is the conclusion of last week’s post on Pixar’s 22 Rules of Phenomenal Storytelling. If you want to refresh yourself on the first 11, click here. Otherwise, read on. 12. Discount the first thing that comes to mind. And the second, third, fourth, and fifth. Get the obvious out of your way. Surprise yourself. I’m not certain I completely agree with this, unless it refers to the revision process. I don’t know that the first thing that comes to mind is the obvious or that the obvious is unacceptable. I do agree with “Surprise yourself.” If you let yourself be surprised by your writing, you could get something magical. 13. Give your characters opinions. Passive and malleable might seem likable to you as you write, but it’s poisonous to the audience. Think back to the seemingly most passive character you’ve ever read. Jane Eyre, for example. A mousy, repressed, prim young woman who molded herself into compliance at the horrid school where her aunt sent her, we find she has definite opinions about Rochester and her life at Thornfield. Or Miss Marple. She always seems to sit placidly by while murder happens all around her, but when she lays out the evidence and fingers the murderer, she is almost vicious in her opinions about the suspects. Giving your characters opinions gives them depth, makes them real, because we’re all human. We have opinions. Just ask my friends. I know the feeling of having something eat at you until you write it down. Sometimes the why isn’t clear until you write the story; then, it all becomes apparent. That’s a great feeling. At a recent panel on creativity, I mentioned how these two characters who are spies tapped me on the shoulder and told me to write about them. My stories about them feed off my sense of social justice, and that’s why I write them. 15. If you were your character in this situation, how would you feel? Honesty lends credibility to unbelievable situations. This isn’t the same as being in your character’s head. This is you, dropped in the middle of your story, but chances are the way you react is the way your character will react. The reader will believe that. Let’s face it, a story would be pretty dull unless the character had obstacles to overcome. We don’t ease through life, so why should our characters? Besides, stacking the odds against them is rather fun. And who says a character always has to succeed? That’s the one issue I had with Miss Marple–didn’t she ever make a mistake? 17. No work is wasted. If it’s not working, let go and move on. It’ll come back around to be useful later. It seems I let go and move on a lot, but it does usually come back around to be useful. It’s more than just saving every version of your story or novel. It’s being able to know when something’s not working. For me, it’s staring at the computer screen, unable to compose or revise. If I belabor it, it only becomes worse. Time to move on, but I know it’s waiting for me when I know the time is right. 18. You have to know yourself. The difference between doing your best and fussing over the story is testing, not refining. “Fussing over the story” is an interesting concept, and it is a fine line between useful refinement and second-guessing every word. I’m definitely guilty of the latter, but as I’ve come to know myself as a writer, I’ve learned to recognize which side of the line I’m on. I’m sure you’ve been in the middle of a suspenseful story, the proverbial runaway wagon full of women and children headed for the cliff, and the writer doesn’t resolve it in a challenging way. Think of that season of the original TV show Dallas where Bobby Ewing was dead the entire season, but we find at the beginning of the next season it was all a dream. I know I felt cheated. 20. Exercise: Take the building blocks of a movie you dislike. How’d you rearrange them into what you do like? That would certainly be a tremendous exercise in creativity. Consider how many movies you’ve left thinking that you’d wasted your money. Now, think about how you’d rewrite them. I know I wish–and I suspect Disney does too–someone would have rearranged the building blocks of John Carter. 21. You gotta identify with your situation characters, can’t just write “cool.” What would make you act that way? This is a corollary, I think, to number 15 above. If you have a character do something, you have to think about what would have to happen to make you do the same thing. Otherwise, the character has no depth, and the reader won’t be interested. When I had a character cross a moral line in a story, I did wonder what I would do if faced with the same situation. The result was no coincidence. 22. What’s the essence of your story, the most economical telling of it? If you know that, you can build out from there. At a recent workshop I attended on creating a world in a short story, the instructor described how a writer he knew one time just wrote the dialogue for a story, no exposition, no character descriptions, just dialogue. That was the economical telling of it, and he went back and added exposition and description–only where it was needed. Maybe the essence of your story is a list of character traits, maybe a location. Whatever it is, recognize it as the infrastructure of a really great story. So, there you have them. Twenty-two rules to make your writing phenomenal–and without going to work for Pixar. How will you incorporate them in your writing? Later this week, look for a post about the very first Press53 “Gathering of Writers,” a one-day intensive workshop in Winston-Salem, NC. Below are the remarks I made yesterday at the Unitarian Universalist Fellowship of Waynesboro‘s Sunday service, which was a panel on creativity and the creative process. With me on the panel were a painter, an actor/playwright, a musician/painter, a dancer, and a stained class artist. It was interesting to hear the similarities among such different artists, and the program was well-received. This may not be exactly what you were looking for in a five-minute speech, but you’ll understand at the end, this was the only way it could go. It was my ninth grade English teacher who told me I was a writer—she caught me writing Star Trek™ and Man from U.N.C.L.E.™ stories in her class and confiscated my notebook. The next day, she gave it back to me and told me to never stop writing, just not in her class. That was when I realized I was a writer, even though I’d been writing stories since third grade. When I’d get my list of spelling words for the week, everyone else just wrote each in a sentence and used them correctly. I wrote a story—usually about horses. I think instinctively I knew as an avid reader that I wanted to do what the people who wrote the books I read did—write. And I ended up doing just that first for an aviation insurance consortium and then for Uncle Sam, as well as for myself. And here’s the coolest thing about writing fiction: when someone pisses you off, you can write them into a story then kill them, and the grotesqueness of the death is in proportion to your level of anger. Then, you can laugh about what made you angry in the first place because, after all, it’s fiction. Writing makes me richer spiritually and mentally—it’s certainly not something that’s made me richer fiscally—because there’s nothing like the feeling of creating a story that comes from your imagination then having people tell you how meaningful it was to them. That’s my payday. To be a writer, you have to write, every day, and you have to read just as much. Writing is like any other art. You have to practice, practice, practice. And it comes upon you anywhere—at your day job, in the middle of a date, in the middle of the night, at any inopportune time you can imagine. The story tells you when it needs to be written, and you must drop whatever you’re doing and tell it. So, it was my characters who told me as a writer you sometimes speak for those who can’t. Sometimes, most times, the story isn’t your story. It’s someone else’s, and he or she has appointed you to write it. That’s a heavy burden, but you write on because there are just things the world needs to know. Who better to tell them than a scribe, once a Pharaoh’s most important courtier, the person who put down history and thereby told a tale? The first writers told their stories in pictures inscribed in their blood or other organic paints on the walls of caves. In some ways, it’s no different today. Each day I go into my writer’s cave, and my tools lay before me. I pick them up, and my mind opens, and the words come, and the story’s told. I know, however, tomorrow, and all the tomorrows, there will be another story and another and another. There has to be. It’s what I have to do.